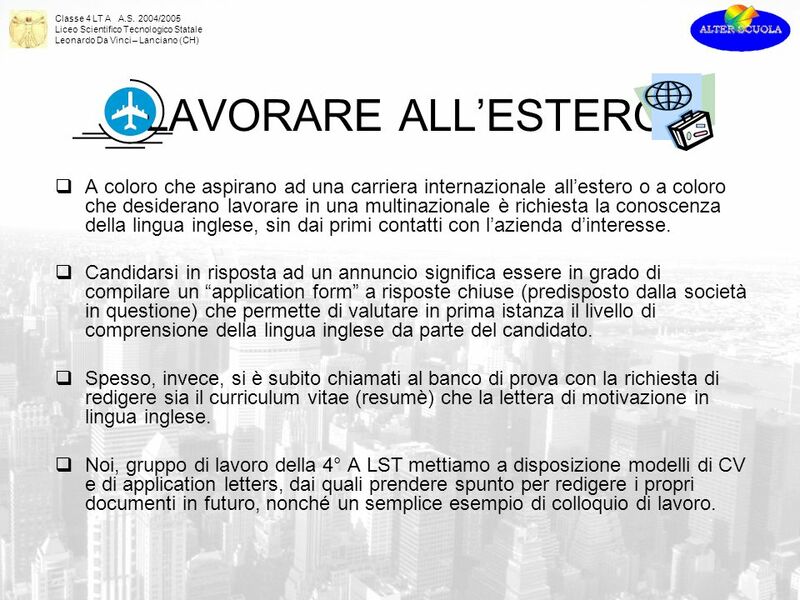 2 LAVORARE ALL’ESTERO A coloro che aspirano ad una carriera internazionale all’estero o a coloro che desiderano lavorare in una multinazionale è richiesta la conoscenza della lingua inglese, sin dai primi contatti con l’azienda d’interesse. 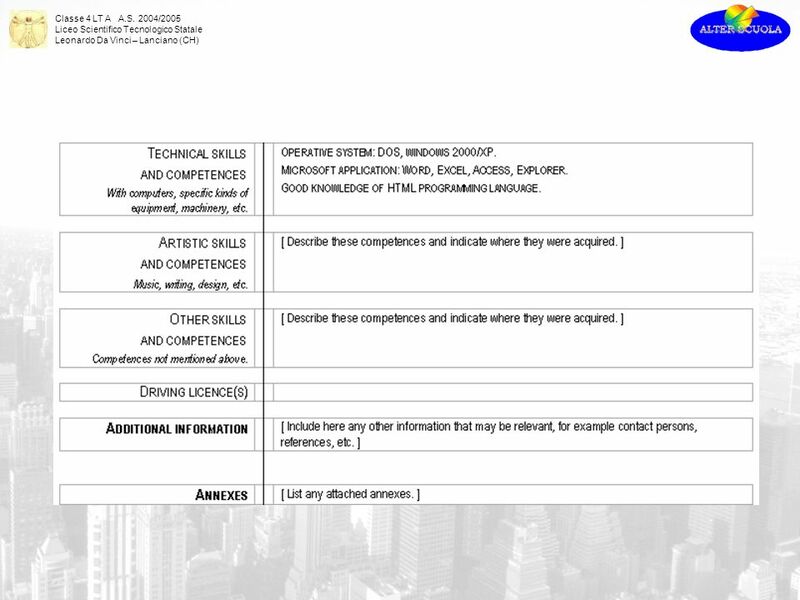 Candidarsi in risposta ad un annuncio significa essere in grado di compilare un “application form” a risposte chiuse (predisposto dalla società in questione) che permette di valutare in prima istanza il livello di comprensione della lingua inglese da parte del candidato. 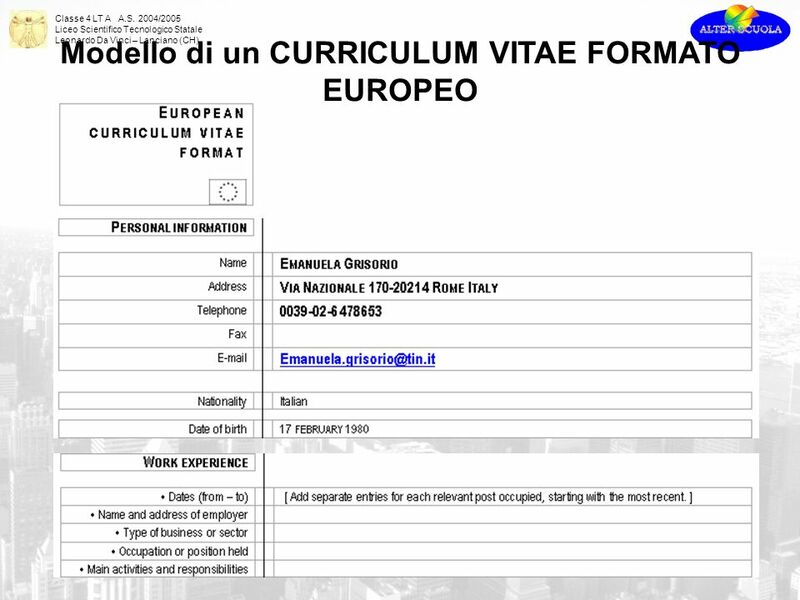 Spesso, invece, si è subito chiamati al banco di prova con la richiesta di redigere sia il curriculum vitae (resumè) che la lettera di motivazione in lingua inglese. 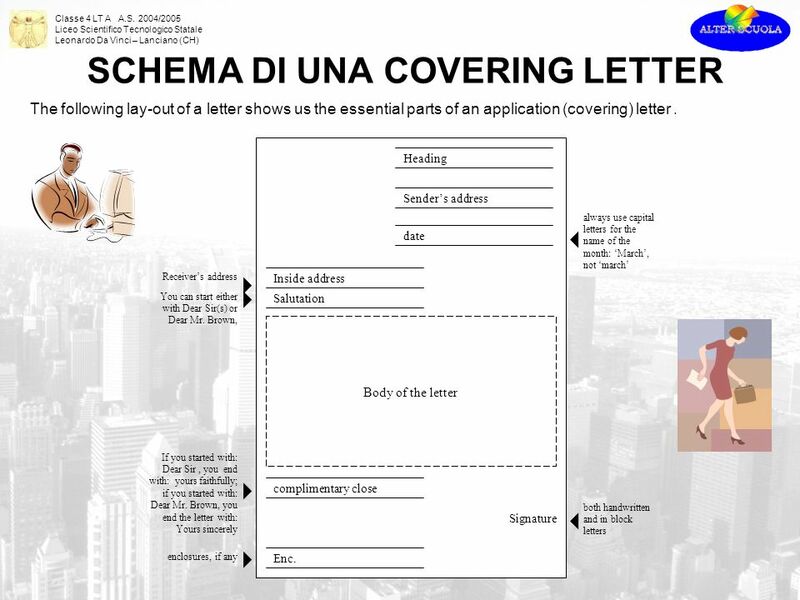 Noi, gruppo di lavoro della 4° A LST mettiamo a disposizione modelli di CV e di application letters, dai quali prendere spunto per redigere i propri documenti in futuro, nonché un semplice esempio di colloquio di lavoro. 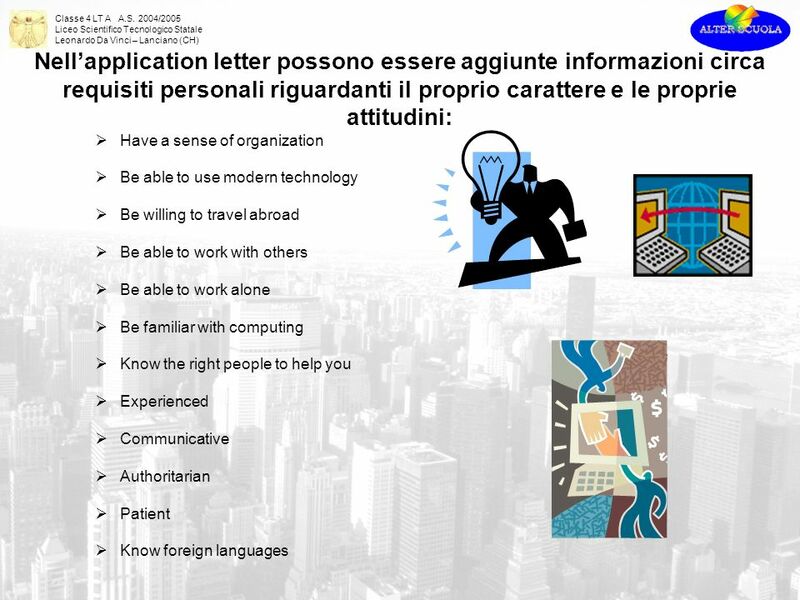 4 Espressioni utili che si possono usare nei vari paragrafi di una Application Letter. I saw/read about your company in today’s issue of <<The Times>> … With reference to your advertisement in <<The Times>> … I am interested in the post of … I should like to apply for the position of… The post you offer gives more opportunities for promotion. As I have carried out various jobs in this field, I feel I would be able to satisfy your requirements for the position. I worked as ……………………….. I have had experience in …………………… I have been working as …………………… with ……………… I enclose herewith my CV with the references of my current employers. My current employers have agreed to act as referees. I look forward to hearing from you. I hope you will call me for an interview. I hope you will consider my application favorably. 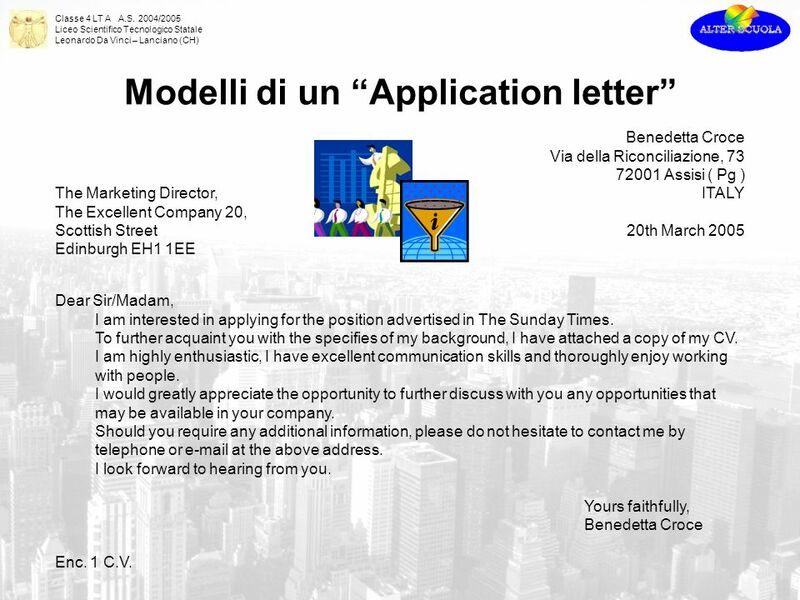 Benedetta Croce Via della Riconciliazione, 73 72001 Assisi ( Pg ) ITALY 20th March 2005 The Marketing Director, The Excellent Company 20, Scottish Street Edinburgh EH1 1EE Dear Sir/Madam, I am interested in applying for the position advertised in The Sunday Times. To further acquaint you with the specifies of my background, I have attached a copy of my CV. I am highly enthusiastic, I have excellent communication skills and thoroughly enjoy working with people. I would greatly appreciate the opportunity to further discuss with you any opportunities that may be available in your company. Should you require any additional information, please do not hesitate to contact me by telephone or at the above address. I look forward to hearing from you. Yours faithfully, Benedetta Croce Enc. 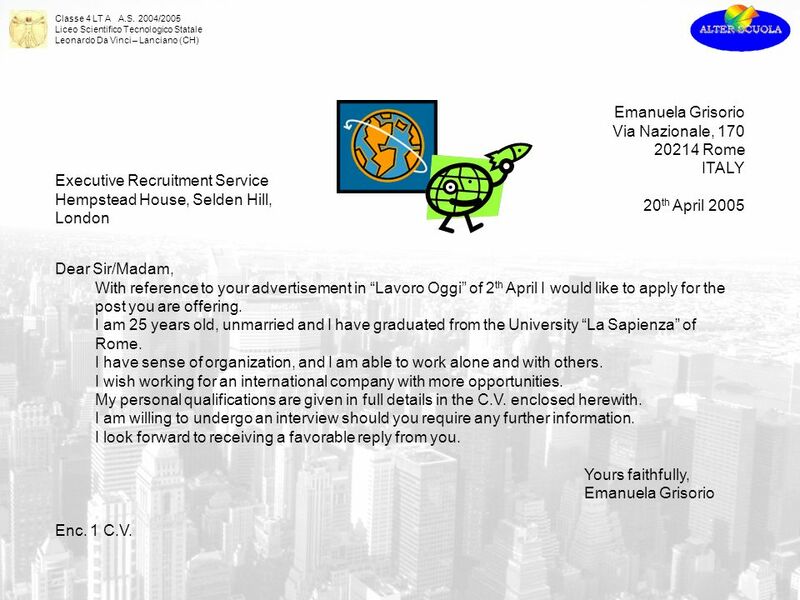 1 C.V.
7 Emanuela Grisorio Via Nazionale, 170 20214 Rome ITALY 20th April 2005 Executive Recruitment Service Hempstead House, Selden Hill, London Dear Sir/Madam, With reference to your advertisement in “Lavoro Oggi” of 2th April I would like to apply for the post you are offering. 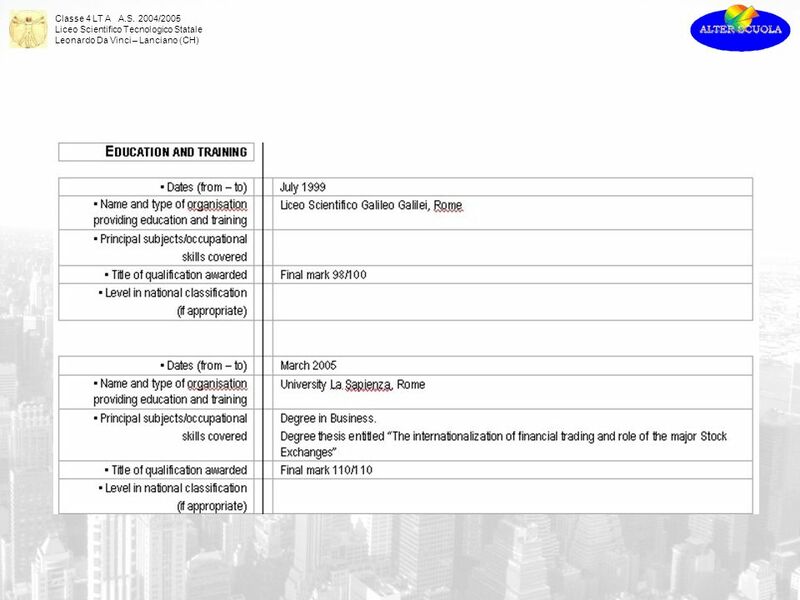 I am 25 years old, unmarried and I have graduated from the University “La Sapienza” of Rome. I have sense of organization, and I am able to work alone and with others. I wish working for an international company with more opportunities. 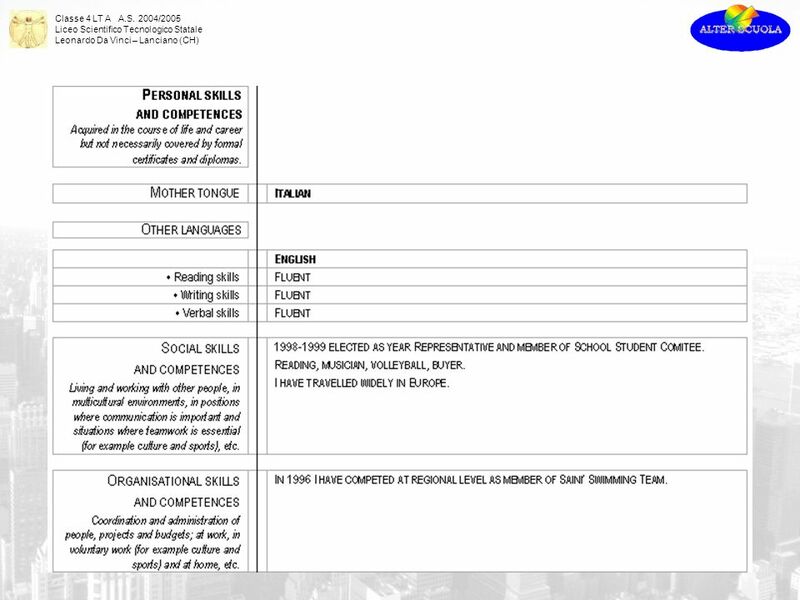 My personal qualifications are given in full details in the C.V. enclosed herewith. I am willing to undergo an interview should you require any further information. I look forward to receiving a favorable reply from you. Yours faithfully, Emanuela Grisorio Enc. 1 C.V.
Q) What is your name? A) My name is … Q) What is your address? A) My address is … Q) What is your telephone number and your address ? A) My telephone number is … my address is … Q) Where do you come from? A) I come from Italy. Q) Where and when were you born? 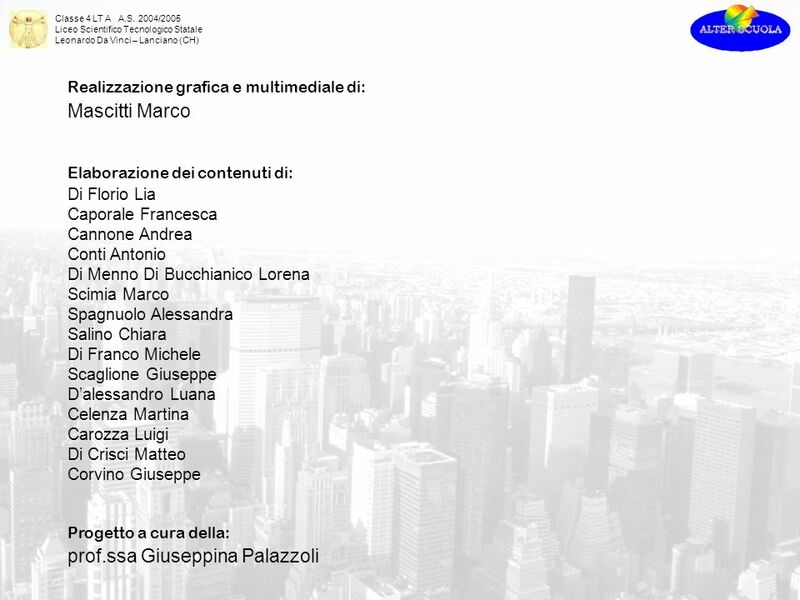 A) I was born in Italy on … Q) What about your work experiences? A) I am experienced only in summer jobs but I am able to learn quickly for my abilities. Q) What university did you graduate from? A) I graduated from … Q) Why did you choose your study course? A) I like Scientific Subjects above all physic, math and also because this course has given me the right knowledge for the requirements of the new economy. 13 Q) What do you like reading? A) Adventures, thrillers, spy stories, magazines, newspapers, science fiction and love stories. Q) How do you spend your free time? A) Practicing Sports, listening to music, reading, gardening and surfing on the net. Q) Why are you interested in our company? A) Your Company has a prominent role in the use of modern technologies and I suppose it can give me good opportunities of career. Q) What are your professional purposes? 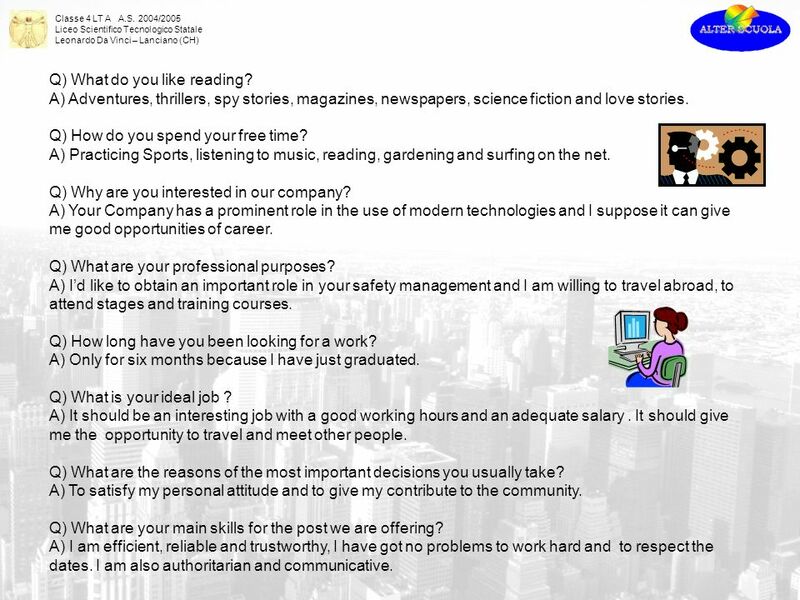 A) I’d like to obtain an important role in your safety management and I am willing to travel abroad, to attend stages and training courses. Q) How long have you been looking for a work? A) Only for six months because I have just graduated. Q) What is your ideal job ? A) It should be an interesting job with a good working hours and an adequate salary . It should give me the opportunity to travel and meet other people. Q) What are the reasons of the most important decisions you usually take? A) To satisfy my personal attitude and to give my contribute to the community. Q) What are your main skills for the post we are offering? A) I am efficient, reliable and trustworthy, I have got no problems to work hard and to respect the dates. I am also authoritarian and communicative. 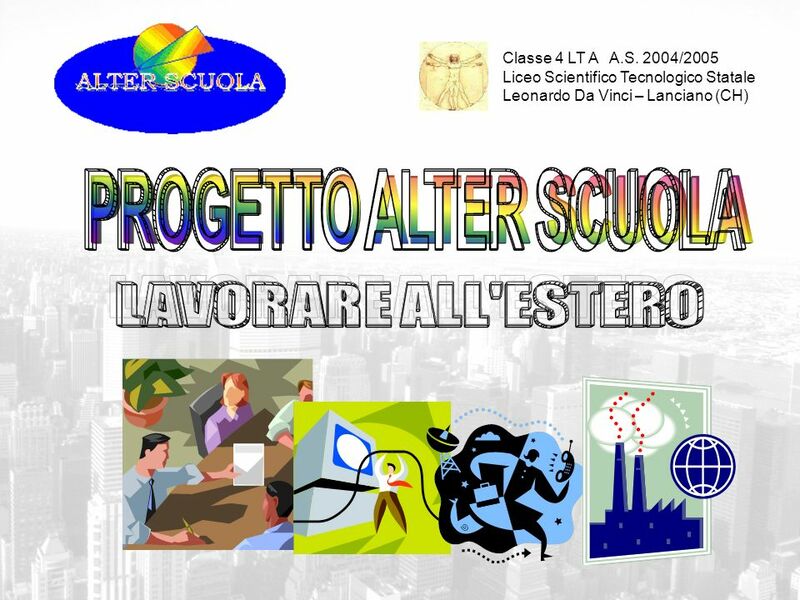 Scaricare ppt "LAVORARE ALL'ESTERO LAVORARE ALL'ESTERO"
Trieste, 26 novembre © 2005 – Renato Lukač Using OSS in Slovenian High Schools doc. dr. Renato Lukač LinuxDay Trieste. We are in it together Living well with dementia the East Midlands. Keeping people with dementia and their carers at the heart of the regional strategy. Giovanni Falcone & Paolo Borsellino. Relaunching eLene Who are we now and which are our interests. EUROPA TERRA DI MISSIONE. Flags of Europe This page contains flags and maps for Europe and its countries. European Union MAPS Europe 1 -- no flag references. Università degli Studi di Cassino e del Lazio Meridionale Dipartimenti di Scienze Umane, Sociali e della Salute Lingua Inglese a.a (Dott. Saverio. Each student will be able to ask an adult or stranger: What do you like to do? and What dont you like to …? piacere The verb to like does not have a direct equivalent in Italian. © and ® 2011 Vista Higher Learning, Inc.4B.2-1 Punto di partenza The verbs conoscere and sapere both mean to know. The choice of verb depends on its context. Punto di partenza Reciprocal verbs are reflexives that express a shared or reciprocal action between two or more people or things. In English we often. MyEconLab_Univerità degli studi di Milano, corso Prof.ssa Valentina Raimondi How to Access MyEconLab 1.